From trending political topics to live feeds to immersive experiences, social media content today is all about how to engage the customer more. Marketers and brands can benefit by leveraging these emerging trends to tell stories that capture the audience’s attention. And today, use of social media is all pervasive. In 2017, the estimated number of social media users was 2.46 billion and growing. It is projected that in 2021, there will be over 3 billion users of social media. Social media is no doubt one of the most effective ways of reaching your target audience by virtue of its sheer size and the available amount of data. You can, using social media, reach a huge audience literally for free by posting organic posts or for a fee with social media advertising. However, to succeed, it’s essential that you understand the latest trends and stay ahead of the curve. Today, deciding where to channel your time and money is not easy when it comes to investing in social media. So, we focus this analysis on social media trends, predictions that are both actionable and realistic. Social media and the smartphone is the marketer’s dream come true as it makes a perfect combination. Over the last few years with the rise in social media trends and statistics, smartphone user’s numbers have grown heavily as there are currently over 2.53 billion global smartphone users. Mobile optimization has, for sure been a best practice in the industry for savvy marketers for some time. However, with Facebook usage not very far from being totally captured by mobile use, brands will ultimately find no excuse for distributing or creating content that’s mobile optimized. From the beginning, Facebook wasn’t really designed as a social media platform for use on mobile, but that has changed dramatically. It’s predicted that by 2020, 59% of Facebook users in the U.S. will exclusively access it through mobile. Looking at other popular emerging apps like Snapchat and Instagram, the trend has largely become mobile-only. The majority of these social networks have also launched call-to-action buttons compatible with mobile apps designed to generate more conversions compared to the traditional web platforms. So, it pays to hone your social media strategies so that they attract mobile users. From major retailers to micro businesses, the role of social media in e-commerce will continue to grow. For example, in 2017, one million new people joined different social networks daily. The social media graph is also shifting with new media making great inroads. By 2020, the world is going to witness increased Instagram dominance, particularly among the older demographics. According to Ryan Holmes, today there are more Instagram users aged 45-54 compared to 13-17-year-olds. Adoption of social media in North America and Europe has been slow. The next social innovation phase won’t be coming from the advanced economies; it will come from the newly-emerging economies. This is fertile ground for marketers. These are the regions where consumers have practically skipped the desktop phase and the traditional search engines. Video accounts for 90% of all content shared on social media by users in 2017. The biggest challenge facing marketers is how to capture the attention of their audience within the first 3 seconds. Videos will, by 2019, make up a massive 80% of all internet traffic and marketers must, therefore, ensure that all their video content is not only engaging but high quality. By 2020, it is projected that video will eventually become the closest a marketer gets to an audience face-to-face conversation. In the coming years, marketers can expect more growth of high-quality live video content which can be leveraged in attracting and enhancing brand affinity. Facebook and Instagram, for example, over the recent years have been launching numerous new video features like Stories and live videos. Recently, LinkedIn also recently launched native LinkedIn videos. The magic lies in researching what exactly your target audience is searching for and testing diverse content to identify what works best for you. Facebook, Snapchat, and Instagram stories have given rise to the growing popularity of ephemeral online content. As brands create social channels content they are also designing a separate strategy to take care of ephemeral content marketing. The majority of ephemeral content gets shared for about a day (24 hours) then it disappears forever. Because content disappears within hours, it prompts followers to act fast, something that marketers can gain from. Ephemeral content sort of accords your business or brand more authenticity. This is prompting many to begin using their Instagram profile to publicize their best stories and high-quality content for real-time content. No longer are Chatbots the clunky, robotic machines they were previously. Several Instant Messaging Apps such as Vine and Telegram had introduced bots on their respective platforms some time back. Today bots can offer an instant customer connection from any part of the world, effectively sorting numerous issues faced by the customer, even ordering delivery of pizza. Facebook indicates that they are now recording 100,000 active monthly bots on their Facebook Messenger. This offers marketers a new platform to connect with audiences. Chatbots give your brand the opportunity to quickly interact with your audience in a unique way that has a more personal connection. Currently, the quickest Chatbot adaptors are Millennials. As bots are becoming more human-like and smarter it’s now much easier to customize brand voice and directly send your personalized messages to users. Machine-generated content is estimated to account for 20% of business content by 2018. You can use Chatbots in efficiently providing 24/7 services to your customers. Chatbots, in a way, are faster than physical human beings when it comes to responding to any data related questions and taking requests. On top of it all, with Chatbots, you will no longer have to engage employees for your customer service desk which makes it a very cost-effective marketing strategy. Like them or hate them, the fact is that Chatbots are with us to stay. In the years ahead, you can expect them to be where customers will be visiting when they want to book a hotel reservation, buy a plane ticket, choose a phone mobile plan or order a pizza. Augmented reality has been designed to take hold of something that’s genuine and then alter it with the help of technology. A classic example of augmented reality applied successfully was the gaming app Pokemon Go. By accessing the user’s camera, the app brought in several fictional angles to the screen for more impact. Some social media channels are already integrating augmented reality into their platforms. You might, for instance, be familiar with the face filters being used by Snapchat. Facebook too has come on board using a camera effects platform. With these features, Facebook is literally taking the concept of augmented reality to a new level altogether. Facebook has even put up an augmented reality studio where developers can design their unique animations. The filters used in the studio respond to interactions and motion in real-time. In the days ahead, augmented reality is set to impact social media in a similar manner by allowing products and online personalities to be directly brought into photos, videos, and homes. And the best thing about augmented reality is that it doesn’t require investing in extra hardware besides the smartphone you already possess. Generation Z is taunted as the next big thing that’s going to happen in marketing. This generation is different from previous generations in several ways. They have been brought up with smartphones and the Internet which makes them more focused when it comes to the speed of buying and the quality of customer service. This group currently makes up over a fourth of the US population. A recent study of social media trends shows that compared to Millennials, Generation Z has more value to most organizations. The oldest among Gen Z today are in their late teens and are just making their entry into the labor market or getting a taste of their first disposable income. It is important for brands to now begin shifting from the long-held millennial-first social strategy and adopt a Gen Z strategy. 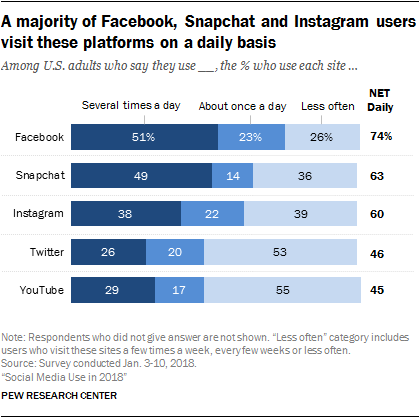 This should focus on platforms that are loved by members of Gen Z such as Instagram and Snapchat. You can connect with nearly all services online by simply pressing the available “connect to us” buttons. This has allowed social media giants to directly get connected with all services as well as in getting insights into behaviors taking place outside of the circles used in social posting. Not only is this trend set to continue but this deep integration of social media is going to increase exponentially. Brands had better be ready to capitalize on this development. Although personalizing marketing is certainly not new, because of the availability of new data, message customization has now become more targeted. Thanks to machine learning and Artificial Intelligence, marketers are moving from sole reliance on demographics to activities, desires, habits, and buying preferences. Companies are further learning how these actionable metrics can be converted into sales. Big retailers like Amazon, for example, are taking advantage of emerging AI-based solutions capable of blending data gathered from diverse sources. These include social media feeds, CRM data, trending sales, historical transaction data, and competitive info. This generates a unique and rare view into the persona of the buyer. By understanding consumer behaviors better, Amazon creates private label merchandise thus effectively competing with specialty retailers and other retailers. You need to have systems in place that help you in monitoring different social media channels for your unique keywords and phrases. The system should then bring those vital mentions to your immediate attention so that your team can critically study them for both opportunities and insight. This is called social listening and is now a must if your brand is to succeed when relying on social media. It’s simply not enough to track your @ mentions. One study has shown that 96% of those discussing brands online don’t necessarily follow the brands’ profiles. There is, therefore, a high probability that you could be missing over 90% of those conversations taking place around your brand. It has also been shown through social media trends that if you fail to take quick action in response to a mention, in 78% of those cases, consumers will bail out. In fact, you can use social listening tools for nearly every facet of your brand ranging from lead generation to customer service and even product design. The most appealing thing about most social listening tools is that they can be customized to suit your particular needs. So if social listening is not yet part of your marketing package, now is an opportune time to start. Influencer marketing is a tactic used by many major brands. Some have, however, classified this marketing strategy as dead and buried. The truth is that influencer marketing is still alive and growing although it has evolved. According to one survey, 30% of buyers have a higher propensity of buying a product that has been endorsed by a non-celebrity. Consumers find it easier to relate more to these micro influencers than to celebrity influencers and they also value their opinions more. In the years ahead, influencer marketing is going to see some changes with brands turning to micro influencers and real experts. This is because consumers want authenticity and those brands that will be working with real influencers will benefit from 60% higher engagement rates compared to using celebrity influencers. In addition, the advent of micro-influencer marketing is cost-effective as brands will no longer need to pay top dollar to celebrity influencers. Consumer trust in academics, government, the media, and CEOs sunk to its lowest levels in 2017 impacting both consumers and businesses. As trust declines, consumers are increasingly turning to a more familiar source of information: each other. We are in essence moving more towards spheres of influence that are somewhat smaller. This is where employees, micro-influencers, and customer advocates matter more than before. Brands can leverage this by setting long-term goals for customer and employee advocacy. Advocacy is an excellent way of fighting declining organic reach while at the same time building real and durable human relationships with employees and customers. Instead of looking for quick fixes to boost your organic traffic focus on creating solid employee and customer advocacy. The next monumental shift since the advent of social media is undoubtedly social messaging. As a matter of fact, social messaging usage today has already outpaced social media usage. It is estimated that combined, users of the leading 4 apps used in social messaging (WeChat, WhatsApp, Viber, & Messenger) are more than those of the world’s top 4 social media leaders (Facebook, Twitter, Instagram & LinkedIn). Alone, Facebook Messenger has over 1.3 billion active monthly users. Instagram is now testing Direct, a standalone messaging app. Despite its phenomenal growth, social messaging does not show any signs of slowing down. The nature of most apps used in messaging makes the message short, going straight to what you want to say. This is cost-effective for the marketer and customers greatly appreciate that as they prefer fast content. If social media opened great opportunities for businesses and brands, then social messaging will do even more and you simply cannot afford to ignore it. Social media presents marketers with endless opportunities to connect with diverse audiences/customers, generate and distribute high-quality and better content, as well as build their brands. Nobody running a modern business can afford to ignore the role of social media. Understanding the changes taking place in social networks is critical to marketers. It’s necessary to constantly evaluate the strategies and media options you are using to identify where you need to focus your time and resources. Facebook, with over 2.2 billion users globally is still supreme both in terms of total users and name recognition followed closely by YouTube and then Instagram. Social media remains more about people than about technology which explains why it has become such a big deal for brands and businesses. It is against this backdrop that major changes are taking place on the social media landscape. For instance, Microsoft has acquired LinkedIn and there is a possibility of someone acquiring Twitter while Facebook is making some changes to its privacy rules and regulations. Certainly, more changes and new trends will keep on occurring in the years ahead. As a marketer, it’s imperative that you stay updated on the latest trends if you are to effectively reach and also maintain your target audience. The consumers of today are all about enjoying the immersive experience. This means videos, imagery, augmented reality, virtual reality, micro-moments, and more. Do your own research on these experiences and decide what the best one for your brand is — and then go big!